A full-strength Cragganmore 1997 bottled in 2009 from a single sherry cask by Diageo for their Manager's Choice series. A marvelous cask strength Speyside whisky but Diageo clearly missed the goal when the marketing deparment set the price for the Managers' Choice range. Nose (90): more than average. honey, floral, fruits, spices, apples, plums, vanilla. 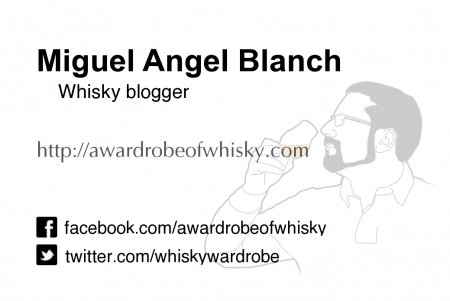 Palate (91): smooth, powerful, oily. honey, spices, floral, some tobacco, vanilla, wood. Very intense with lots of tobacco leaves taste. Finish (90): longer than average. honey, tobacco, vanilla. So based on other whiskies I have already tasted I rate this Cragganmore 1997 Managers Choice with 90 points over 100. A secret recipe cocktail created by the genius minds at Master of Malt. This cocktail was created in occasion of this Leap year and Master of Malt organized a contest for guessing with five ingredients are used in the recipe. The winner will be also entitled to name the cocktail when it is released to the public. Nose (88): average. gin, honey, cinnamon, ginger, cardamom. Very nice nose. Palate (90): smooth, oily. honey, ginger, cinnamon, gin, rosemary, red hot peppers, wood. Finish (89): longer than average. ginger, honey, floral. So based on other whiskies I have already tasted I rate this Secret Leap Year Cocktail with 89 points over 100. The Glendronach �Parliament� both complements Glendronach core range and continues the great GlenDronach tradition of offering fruit-laden intensity in its single malts. This Speyside whisky matured in a combination of the finest Oloroso and Pedro Ximenez sherry casks. This is a stunning single malt whisky from this Speyside distillery with a massive sherry flavor. Only for sherry-heads. Nose (89): more than average. floral, citrus, nuts, leather, wood. Palate (89): smooth, powerful, oily. leather, floral, nuts, wood, dates, cocoa, rubber. Oloroso madness! Finish (88): long. Leather, wood, raisins, floral. So based on other whiskies I have already tasted I rate this Glendronach 21 year Parliament with 89 points over 100. Master of Malt has given me the chance of tasting the oldest Glenfarclas whisky to date, an outstanding 58 years old single cask cask strength single malt whisky choosen by an elitist tasting panel: Serge Valentin, key member of the internationally renowned Malt Maniacs, Master of Malt’s Sales Director Ben, Michal Kowalski of investment company Wealth Solutions and George Grant, of Glenfarclas. How old is it? This whisky was distilled in 1953. For me the date is unfathomable. My parents wasn’t even born in 1953. My country was just starting to recover from a civil war that set it to ruins and the whole world was healing from the 2nd World War. And the grandfather of George Grant was distilling this whisky as his father and his grandfather before him had done for years in a small distillery on the North of Scotland. I have to say I have been waiting for days to taste this one. And today, my first holiday day is the chosen date! The oldest released Glenfarclas single malt whisky bottled to date. This stunning single malt has been chosen by a panel of experts, between whom you can find Serge Valentin and George Grant, from the oldest casks that distillery had available by Wealth Solutions in collaboration with Master of Malt. Only 400 bottles at cask strength has result after 58 years of ageing in a Spanish sherry oak cask. Nose (93): more than average. candies, eucalyptus, wood, spices, candies, flowers, cinnamon. Like a marvelous wooden box full of violets candies! Really complex and evolving. Palate (92): powerful, oily. honey, nuts, wood, spices, figs, flowers, cinnamon, cocoa. So intense whisky! It is almost smoke on the palate. Finish (93): long. honey, wood, flowers, citrus. 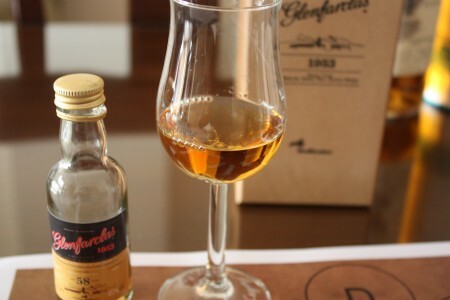 So based on other whiskies I have already tasted I rate this Glenfarclas 1953 - 58 Years Old with 93 points over 100. The oldest and most expensive bottle of my collection, even if this one has never been available for sale. I like this whisky, not that I see myself drinking this single malt but I like it. I plan doing a vertical tasting of Glenfarclas in the following weeks and this whisky will have an honor place there for sure. Nose (89): more than average. honey, floral, candies, meat stock, wood. Palate (92): powerful, oily. honey, nuts, floral, citrus, spices, wood, liquorice. Finish (90): longer than average. honey, spices, citrus, nuts. So based on other whiskies I have already tasted I rate this Aberlour a'Bunadh Batch 38 with 90 points over 100. Palate (92): smooth, powerful, oily. peat, honey, floral, citrus, wood, peaches, vanilla, earth. So based on other whiskies I have already tasted I rate this Brora 30 Year Old / 8th Release / Bot. 2010 Highland Whisky with 91 points over 100. A 12 year old from Auchentoshan, this was aged in European oak Fino sherry barrels before bottling 2010. The results are creamy and very fruity, and at cask strength there's a lot going on. A great malty character with the sweetest touch of nuts. Nose (90): more than average. honey, barley, citrus, vanilla, floral. Palate (89): smooth, powerful, oily. honey, spices, nuts, floral, citrus, vanilla, barley. Finish (90): longer than average. honey, vanilla, citrus. So based on other whiskies I have already tasted I rate this Auchentoshan 12 year 1998 Fino Sherry Cask with 90 points over 100. This single malt whisky was distilled at Macallan in the Autumn of 1997. It was then aged for 12 years in refill hogshead number 5745 before bottling by Douglas Laing in the Winter of 2010. This whisky is the most floral Macallan that I have had. Not a single trace of that incredible sherry character Macallan whiskies usually have. Nose (85): more than average. honey, some floral, spices, vanilla, citrus. Very floral Macallan. One of the most floral I have ever had. Finish (83): longer than average. floral, citrus, vanilla. So based on other whiskies I have already tasted I rate this Macallan 12 Year Old 1997 Cask 5745 - Provenance (Douglas La with 84 points over 100. Bottled for Diageo's Manager's Choice series, this single cask Dalwhinnie 1992 is a deliciously biscuity dram, with crisp malty notes and hints of cinnamon and lemon curd. A class act. A marvelous cask strength highlands whisky but Diageo clearly missed the goal when the marketing deparment set the price for the Managers' Choice range. Nose (90): average. toffee, citrus, spices, baked apples, cinnamon, fruits, nuts. Palate (92): . honey, nuts, vanilla, spices, wood, floral. Finish (90): longer than average. honey, floral, spices. So based on other whiskies I have already tasted I rate this Dalwhinnie 1992 Managers' Choice Highland Single Malt Scotch Whisky with 91 points over 100. This single malt whisky was distilled on the 29th March 1965 at the Glen Grant distillery in the Speyside. It was aged for 43 years in hogshead 2136 before bottling on the 2nd June 2008 at cask strength. A release of 121 bottles from the Carn Mor range. Nose (92): more than average. sweet, spices, flowers, apples, cinnamon, candies. Palate (90): smooth, powerful, oily. candies, floral, spices, wood, cinnamon, citrus. Finish (89): longer than average. sweet, wood, floral, spices. So based on other whiskies I have already tasted I rate this Glen Grant 43 Year Old 1965 (Carn Mor) with 90 points over 100. A little piece of whisky history here - the first legal single malt whisky made at the Abhainn Dearg (Red River) distillery in Uig on the Outer Hebridean Isle of Lewis. 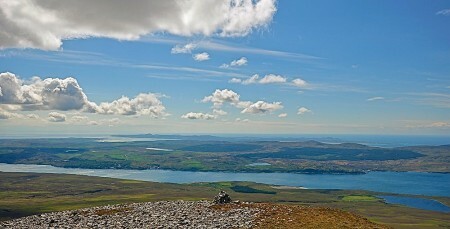 Established in 2008, Abhainn Dearg is the most westerly distillery in Scotland. And they have just released their single malt at a incredible retail price of £150. 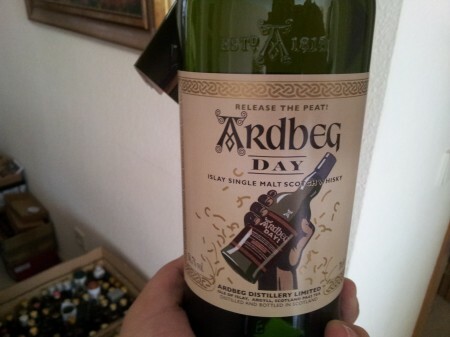 Looks like they are targeting their single malt to collectors instead of drinkers. It isn't a bad whisky but it has still a long way to mature in the cask until it is a good one. Nose (75): more than average. floral, fruits. Very newmake even after 3 years. Palate (79): dry, powerful. many floral, honey, spices, pepper. Slightly sharp. Maybe a few years more on the cask? Finish (79): longer than average. floral, licorice, spices. So based on other whiskies I have already tasted I rate this Abhainn Dearg 2008 / First Bottling Island Single Malt Scotch Whisky with 78 points over 100. The premium whisky from Chivas Regal Bros, this 18 years old blended scotch whisky has an important part of Laphroaig in the mix. Premium aged mix of some of Scotland's finest whiskies with an above-average proportion of malt and an extended ageing period producing a truly fine blend. Nose (86): more than average. honey, floral, wood, malt, citrus. Not bad. Palate (88): powerful, oily. peat, honey, spices, floral, wood, citrus, cocoa. Not bad, not bad at all. Finish (87): longer than average. floral, honey, wood, spices. So based on other whiskies I have already tasted I rate this Chivas Regal 18 year with 87 points over 100. Reviewing John Cor, cheapest whisky ever! There is a supermarket brand in Spain that is breaking the market by selling quality products at almost half the price of their competition: Mercadona. Their technique consists on stocking only one store brand and just another brand at best for most products they have on the store so they have from bread, yogurts, ham, beer and of course scotch at prices that make other supermarkets looks like Harrods! Probably the malt whisky inside this come from Scotland and the rest of the grain whisky is from Jerez which has a strong tradition of distilling alcohol for brandies. Well, what all the buzz is about? Well, Mercadona sells the 70cl bottle of this John Cor whisky for 4.85�, that are about £3.90. Yep! That’s less than four pounds for a full bottle of blended whisky. You should know the fact that Spanish Taxes on alcohol are 2.7€ on a full bottle so the price of the whisky and the glass bottle is 2€ in fact. Can you get anything cheaper? So here is the tasting note. Zero expectations before tasting it. Scotch blended whisky bottled in Spain. John Cor is the name of the friar who recorded the first known written reference to a batch of Scotch Whisky on June 1, 1494. �To Friar John Cor, by order of the King, to make aqua vitae VIII bolls of malt.� � Exchequer Rolls 1494�95, Vol x, p. 487. Nose (79): average. toffee, vanilla, floral, alcohol. Lots of toffee and not much more here. Smells almost like caramel vodka. Palate (78): light. toffee, floral, citrus, alcohol. Finish (76): average. citrus, honey. 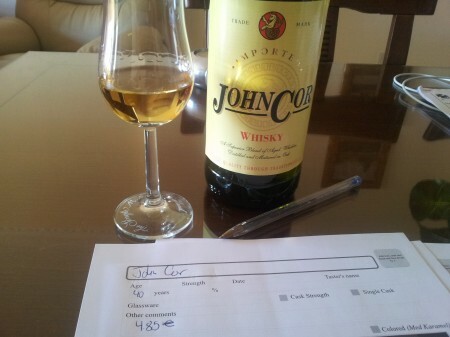 So based on other whiskies I have already tasted I rate this John Cor with 78 points over 100. Maybe with ice and cola it is awesome, but doing it in the same way I do with the rest of whiskies John Cor is a mediocre blended whisky at best… unless you are really budget-constrained you should be drinking something better… afford yourself a luxury whisky such as DYC instead and do a favor to your liver. Don’t worry for the rest of the bottle! It works great for cleaning glasses. Did you get yours? How did you celebrated it? The latest Brora 30 years old is a very welcome return to form. Big and brooding, with a firm peppery, tweedy character and hints of coffee and dark chocolate. Nose (91): more than average. peat, wood, fruits, apricot, vanilla, floral. Palate (91): smooth, powerful, oily. peat, wood, spices, floral, pepper, papaya. Finish (90): longer than average. peat, wood, spices. So based on other whiskies I have already tasted I rate this Brora 30 Year Old / Bot. 2009 Highland Single Malt Scotch Whisky with 91 points over 100. Palate (91): smooth, powerful. honey, floral, citrus, candies, spices, vanilla. So based on other whiskies I have already tasted I rate this Glen Grant 34 year 1975 Old Malt Cask with 91 points over 100. This 16 year old Glen Grant single malt whisky was distilled in May 1995 and aged in cask 85118 before bottling by Duncan Taylor in October of 2011. A release of 227 bottles. Nose (88): more than average. honey, vanilla, floral, citrus, varnish, wood, cinnamon. Palate (92): powerful, oily. honey, malt, floral, vanilla, citrus, spices, pepper. So based on other whiskies I have already tasted I rate this Glen Grant 16 Year Old 1995 - Rare Auld (Duncan Taylor) with 90 points over 100. A 27 year old Port Ellen single malt whisky distilled in 1982, just a few months before the distillery was closed forever. This is a rare whisky, aged in Bourbon casks and finished in Chateau D'Yquem sauternes barrels. This was bottled at the Bruichladdich distillery in 2009, and is part of a release of 1,175 bottles. Nose (89): average. peat, floral, fruits, salt. Very restrained nose for a Port Ellen whisky. Palate (92): smooth, powerful. peat, honey, citrus, floral, earth, coffee, spices. Finish (91): long. peat, floral, sweet. So based on other whiskies I have already tasted I rate this Port Ellen 27 year 1982 Mission Murray McDavid with 91 points over 100. A beautifully dark whisky from Glen Grant bottled by Signatory. This scotch whisky was distilled on the 17th March 1969 and matured for 40 years in a single cask, a fresh Oloroso sherry hogshead number 2016. This single malt whisky was bottled at cask strength on the 14th September 2009. There are just 188 bottles of this! A nice example of nice sulphured whisky. Excellent Glen Grant. Nose (89): average. candies, spices, nuts, pepper, citrus, floral. Palate (90): smooth, oily. sweet, citrus, wood, spices, powder, floral. Finish (90): longer than average. sweet, spices, citrus. So based on other whiskies I have already tasted I rate this Glen Grant 40 year 1969 Cask Strength Collection with 90 points over 100. A very limited release edition Auchentoshan 1975. This has been aged for thirty-five years in bourbon casks before bottling. Just 500 bottles of this have been released, and the whisky is described as having a butterscotch and rum& raisin toffee character. Marvelous candies and floral aromas in this Lowlands single malt whisky. Nose (91): average. candies, floral, vanilla, citrus, cinnamon, wood. Palate (90): smooth, powerful, oily. candies, spices, vanilla, floral, citrus, cinnamon, wood. Finish (90): longer than average. wood, sweet, cinnamon, floral. So based on other whiskies I have already tasted I rate this Auchentoshan 35 Year Old 1975 - Bourbon Cask Matured with 90 points over 100. Ginger Tam's is a whisky liqueur with ginger. And when I say that this drink has ginger, I mean it is ginger with whisky. If you like ginger it can be a great drink, on the other way just use it on a nice pie. Nose (80): more than average. ginger, citrus, floral, herbs, honey. Palate (78): powerful. ginger, honey, citrus, floral. Finish (80): longer than average. ginger, honey. So based on other whiskies I have already tasted I rate this Ginger Tam's Whisky Liqueur with 79 points over 100. A 31 year old Speysider, this was distilled at Miltonduff on the 18th May 1979, it was aged for 31 years in a single hogshead, before bottling by Signatory on the 24th November 2010. A release of 188 bottles. Mosstowie is whisky distilled at Miltonduff from malted barley, but in column stills! Which by today standards would rule it out as single malt scotch whisky. Nose (86): average. floral, honey, candies, nutmeg, vanilla. Smells like PEZ candies. Interesting. Palate (91): smooth, dry. floral, honey, citrus, spices, vanilla, wood. Finish (90): longer than average. honey, floral, wood, spices. So based on other whiskies I have already tasted I rate this Mosstowie 31 year 1979 Cask Strength Collection with 89 points over 100. A Signatory bottling of Glenisla, an experimental malt whisky distilled at Glen Keith using lightly peated malt and distilled heavily peated water. Slightly mad and very rare. Nose (79): more than average. honey, many floral, pepperoni . Very floral and then really strange. I swear it smells of saucisson. Unpleasant. Palate (79): smooth, powerful. floral, spices, wood, pepper, pepperoni. Finish (80): longer than average. floral, plums, dried apricots, spices. So based on other whiskies I have already tasted I rate this Glenisla 1977 / 28 Year Old Speyside Single Malt Scotch Whisky with 79 points over 100. A stunning Highland Park 30 years old bottled at high strength, over 48% abv. This single malt whisky from this Orkney distillery has a good amount of sherry casks used on it. It portraits also the awesome heather theme present on most Highland Park scotches. Nose (94): more than average. honey, raisins, floral, spices, cinnamon. Lovely! Sweet raisins. Palate (93): smooth, powerful. honey, leather, nuts, floral, spices, wood, cocoa. Sherry epitome! Finish (93): longer than average. honey, nuts, floral. So based on other whiskies I have already tasted I rate this Highland Park 30 year with 93 points over 100.